Funny things happen in the restricted environments. Normally, if you download a zip file from the internet, you can use “unblock” option to instruct the system that this particular zip file is safe. Well, not on that particular workstation which I had to work on today. There was just no “”unblock” option at all. 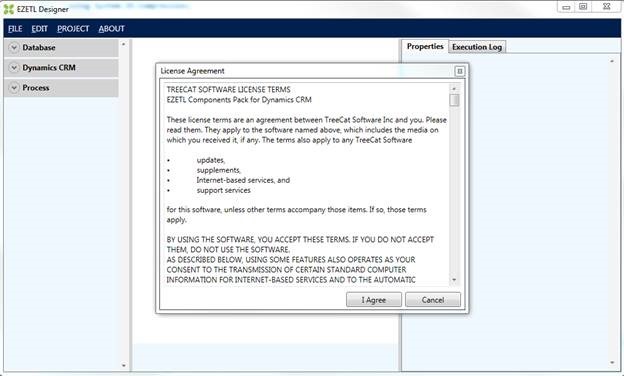 The caveat here is that you might do some damage with this command if, for example, you ran it against your C drive.. so, make sure to use it only on the directories which don’t have anything but your files. 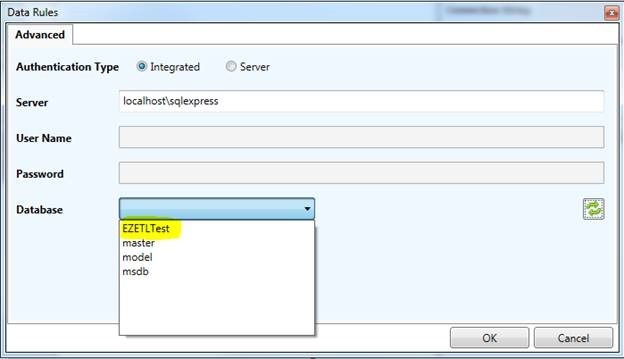 However, there are two client-side SDK features which will allow you to create reusable validation logic. 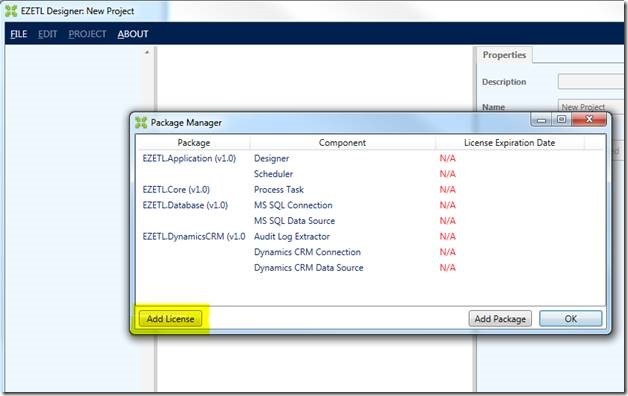 Namely, those are the ability to pass execution context and the ability to set control notifications. 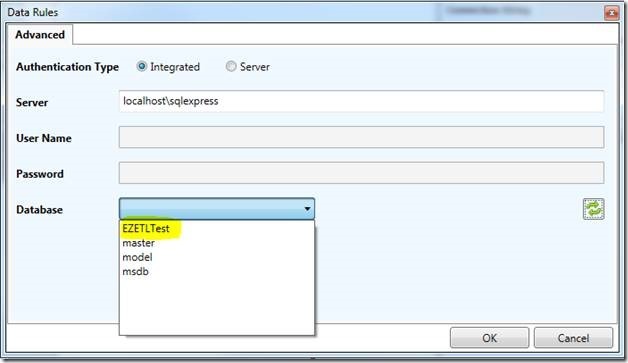 Once you have execution context, you can use getEventSource call to find out Xrm.Page object model that is the source of the event. 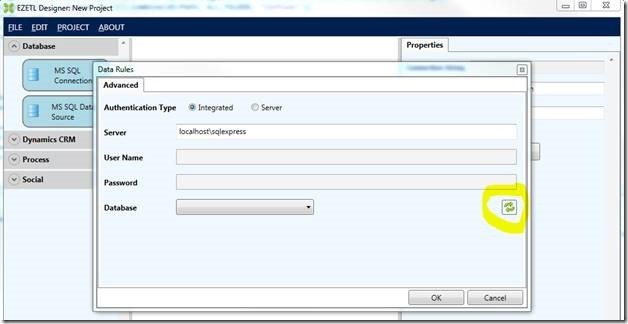 Which means you don’t need to pass attribute names to your validation scripts, you just need to make sure “execution context” is passed as a parameter when configuring your event handlers. As for the setNotification, that’s just a nice simple notification mechanism which you can use to stop CRM from saving data when/if your validation fails. Now that we have the project saved, let’s see how to make our data move from one MS SQL table to another. First of all, remember that “For Distribution” option? Make sure it’s set to false. You don’t want to lose your connection settings while working on this project. That’s it, we have our SQL connection configured. 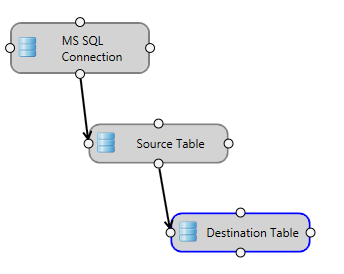 Now we need to add two data sources (one for the source table, and one for the destination table). 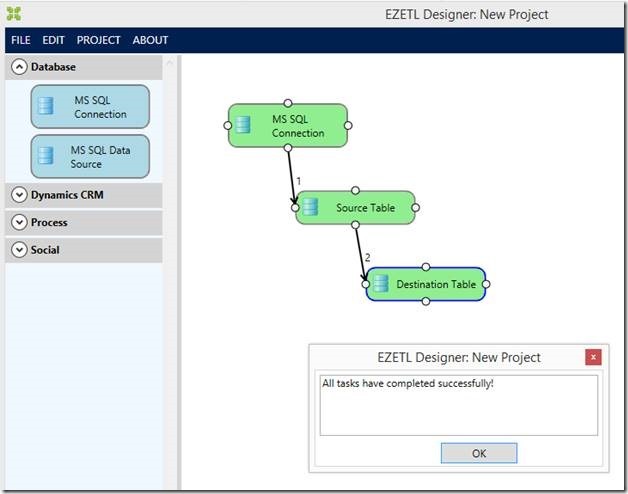 The reason we want to have a connection between MS SQL Connection and the Source Table is that we will control project execution sequence that way. Even though no actual data will be passed from MS SQL Connection component to the Source Table. 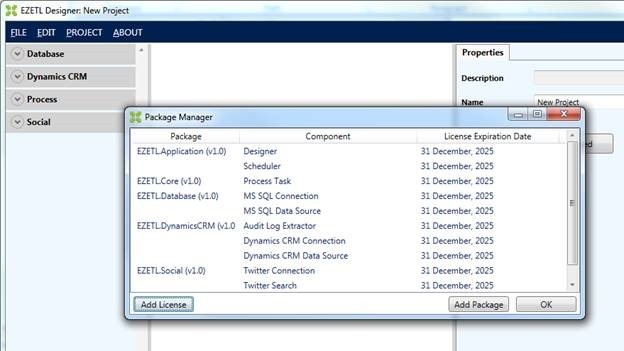 Now let’s configure the Source Table component. – Select “Source Table” component. 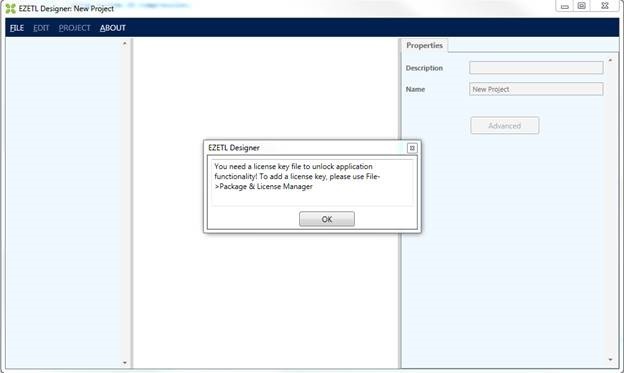 You can select any component on the designer surface and have a look at its properties by clicking on that component. We are almost there – just need to configure field mappings from the source to the destination. Click OK. 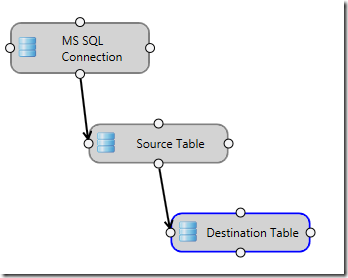 The project is ready – you can start it and see how your source table data goes to the destination table. As you can see, exactly 2 records have been moved from the Source Table to the Destination Table as a result. You might want to verify it in the SQL Management Studio just in case.. 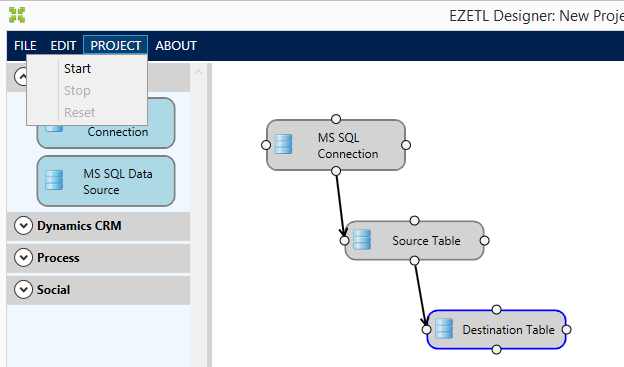 There is also one magical record that was passed from the SQL Connection to the Source Table. We don’t need to worry about that one, though, it we wanted to capture it, we could. There is some information about the connection in that record, but it’s of no interest for now. And that’s it – our first “Hello World” project is up and running. 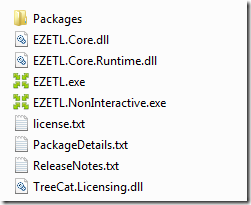 It might not be of much practical use, but it shows how EZETL works and how easy it is to create ETL packages in this tool. Let’s do something simple first, and, then, we will move on to a more complicated (but, hopefully, to a more rewarding) stuff. For this one, let’s create a project that will be moving data from one table to another in your MS SQL database. 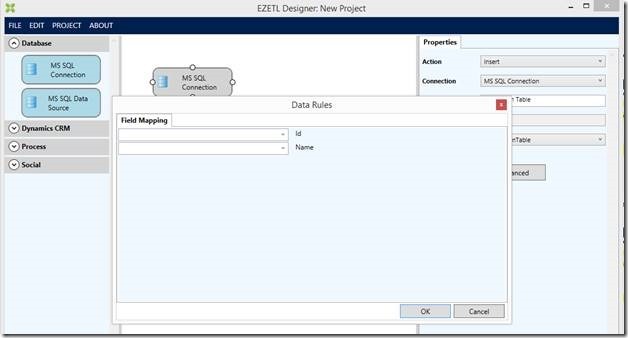 Also, for the sake of this exercise, let’s ignore the fact that you can do the same in the SQL Management studio using a relatively simple query. 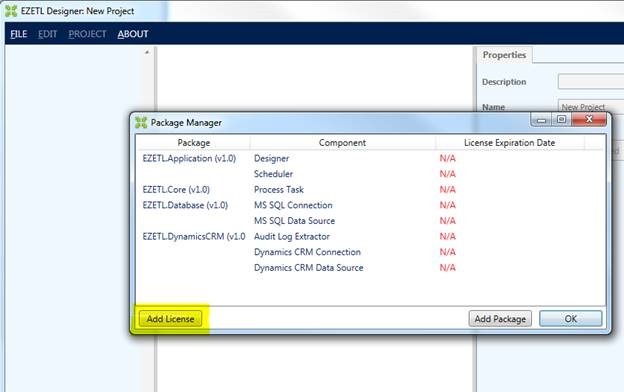 So far so good – we are now done with the preparations, so we can move on to creating an actual EZETL project. 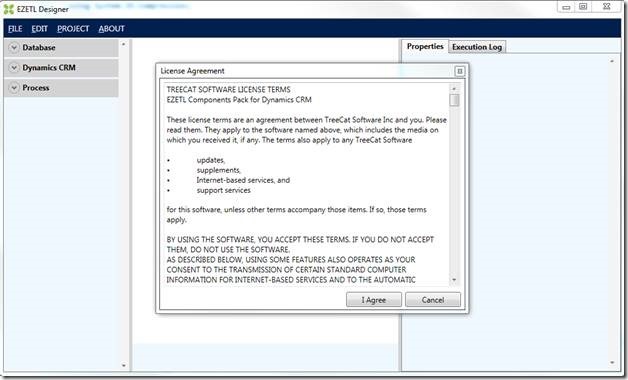 I’m assuming you’ve already installed the software, you have added your license keys. If not, please refer to the EZETL Installation article to see how those steps are done before proceeding to the rest of this post. In both cases, just move mouse to one of the properties on the right side and click in the corresponding text box. You will either be able to work directly in that text box, or, as it happened above for the “description”, you’ll be presented with a popup window where you can enter desired details. 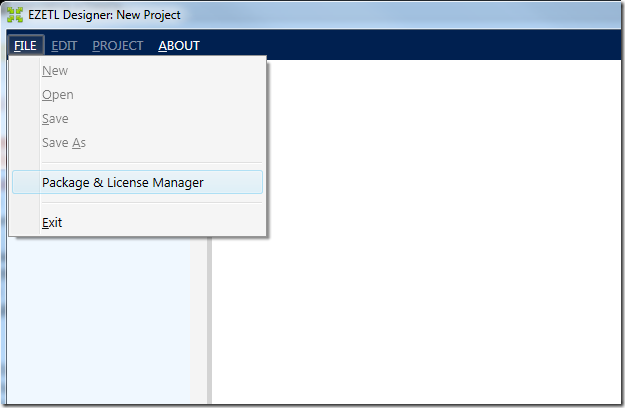 Now let’s save the project so we don’t lose our work. 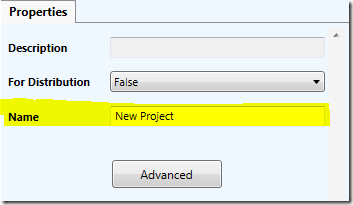 Notice that you can also open an existing project.. you can create a new one.. Or you can save your project into a different file (“save as” option). Now at this point you might want to ask how/where the data is saved. 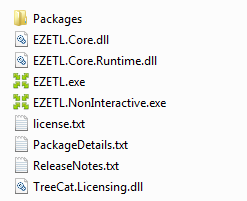 And the answer is: EZETL projects are saved as “xml” files. Some parameters might be encoded, others might not be encoded. As a rule of thumb, you can assume that sensitive data may show up in those files if you take no precautions. This one can be a little tricky, though. 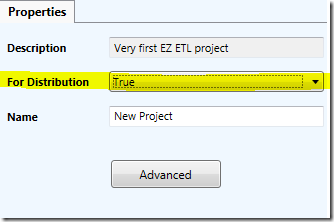 It will be up to the specific data component to define properties which cannot be saved in the project file when “for distribution” is set to true. 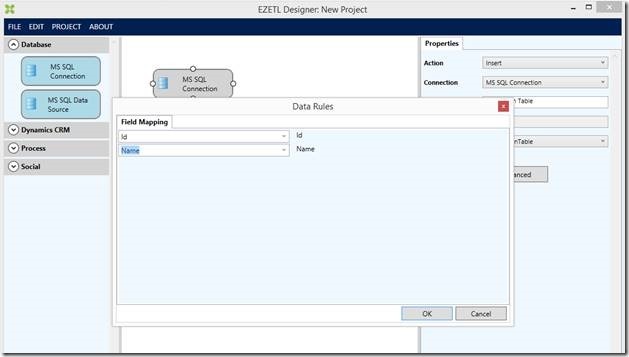 For example, this will prevent MS SQL connection parameters or Dynamics CRM connection parameters from being saved. 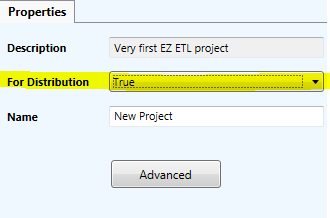 However, this feature is, likely, more useful for project distribution rather than for protecting the data in general since you would use it to create projects you want to send to somebody else. Just like we do it with sample projects here, for example. But we’ve really got sidetracked. 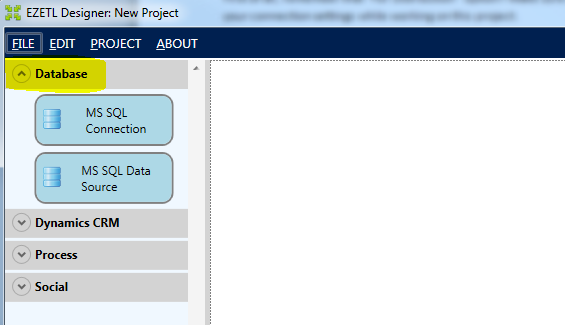 Remember we just changed the name & description, saved the project.. And we have not done any work with the data yet – that’s what we are going to do next.